This is not wrestling, this is Lucha Libre. Feel and closely experience the most popular Mexican sport and learn its moves. Wear the mask and become a famous fighter, like Santo, Blue Demon and more legends of Lucha Libre. Before the show, enjoy a glass of "pulque" or beer in one of the most popular and famous pulquerías in the city. 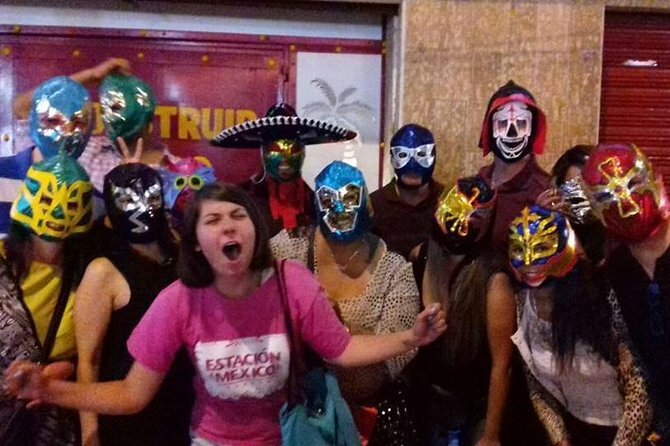 Your guide will share his or her knowledge, happiness and personality so you truly live a great lucha libre experience in Mexico City. First, you will head to one of the best "pulquerias" and have a glass of "pulque" which is a 100% Mexican drink and has been around since the prehispanic times. You will have the flavor of the day and also enjoy the live music being played at the place so you can dance to the tunes if you'd like. You will then head to witness a Lucha Libre match at Arena Mexico, the place where this sports famously takes place. See the "luchadores" (wrestlers) wearing their masks and wrestling one another with special moves. You will have a time to remember here as you cheer for your favorite wrestler. As you watch them, your guide will provide you with commentary on the history of this sport and answer any questions you may have. This is a great tour of lucha libre and pulque, two traditions that are still preserved in one of the world's biggest cities. For reasons of logistics, the group must enter completely to all the sites to visit, it's not PubCrawl, so it will not be possible to receive people outside the time on the meeting point. In case of not arriving on time, there is no refund, it's only possible to change the date for the next tour in which there is a seat available, we appreciate your understanding.